This unique bed presents a wonderful centerpiece for your bedroom setting. Showcasing a ladder-style headboard and footboard with thick legs, the sturdy bed features transitional design elements. Completed with a light brown finish, this bed will transform your home's style and design. 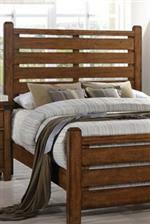 The 1022 Logan Queen Bed by United Furniture Industries at AHFA in the area. Product availability may vary. Contact us for the most current availability on this product. 1022-52/68 King Headboard and Footboard 1 0" 0" 0"
The Logan collection will transform your home with rustic style accents. Featuring transitional designs, the accommodating furnishings will complete your space. 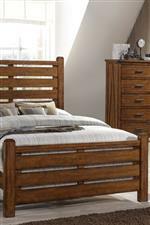 The 1022 Logan collection is a great option if you are looking for Transitional Mission furniture in the area.